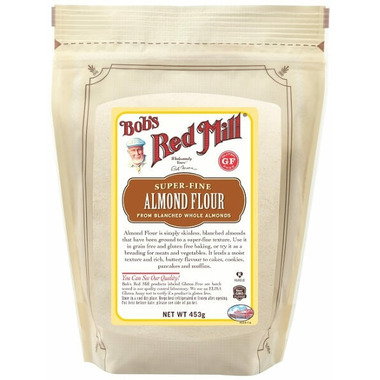 Bobs Red Mill Almond Flour is ground from whole, blanched sweet almonds. Almonds are notoriously healthy nuts providing a good amount of manganese and vitamin E , as well as a healthy serving of monounsaturated fats in each 1/4 cup serving. Not only do almonds have a healthy boost of protein, they are also very low in carbohydrates and inherently gluten free. Eating whole almonds is terrific, but did you know that adding almond flour to your baking and cooking can bring the health benefits of almonds to your diet, as well as cutting back on carbohydrate consumption? Replacing 25% of regular all-purpose flour in your baking with almond meal flour will add wonderful texture and flavor while reducing the total carbohydrates. This makes it perfect for those following a low carbohydrate or paleo diet. There are so many health reasons to buy almond flour! Almond flour meal is produced in our gluten free facility, making it an ideal addition to a gluten free diet. In addition to low carbohydrate baking, almond flour is wonderful for use in French macarons and financiers, pie crusts, cakes, cookies, pancakes and quick breads. Almond flour can be used in savory applications, as well. Use almond flour in place of bread crumbs in meatballs, or as a coating for chicken and fish. Find recipes for using almond flour under the recipe tab below. Almond flour is best kept refrigerated or frozen. This flour is great for low-carb baking. It's the only one I use and I always get the expected results. We enjoy baking with this brand of Almond flour. We tried the recipe on the packaging and the cake turned out to be delicious. Very good quality flour. All our baked goods using this almond flour were delicious. Great product, my son with serious peanut allergy now enjoys keto bread due to Bobs peanut free facility. Thanks to the company for their efforts in that regard. Great product, nice to be able to make low carb morning breakfast cookies with this. Very filling and satisfying. A little pricey but great! Great product, glad to see the almonds are steam pasturized, works well in all recipes I've tried it in so far, would buy again. Great for making keto-friendly bread. Love this company! Great product, works well in baking. Love that the almonds are not treated with ppo. Would buy again. I use this all the time for paleo baking and love the super fine texture. Great product!